I seem to be pinning lots of outfits involving trainers lately. So when I finally got my hands on a new pair of converse I had lots of inspiration on how to style them up. I remember buying my first pair when I was about 14/15 and wearing them until they had holes in a practically fell off of my feet.In The ‘band tee’ – something I always wore as a teenager. I had a drawer full of them. Mostly because I was at 3 gigs a week minimum back in high-school and I bought one at every merch stand I could. Most of these have had to go to charity as I’m not the size I was at that age. 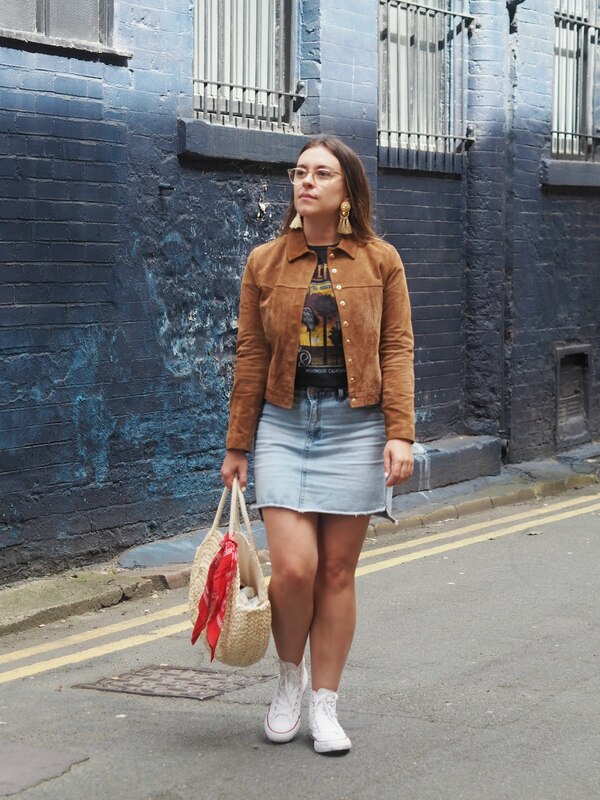 I like the way band tees look with denim so I decided to style it up with a simple denim skirt. I wanted to make sure I could still wear these pieces in a more sophisticated way, as I’m actually not far away from 30 now (no way I hear you cry). I feel like a piece like this can elevate any outfit. Of course I finished off my look with THOSE statement earrings from H&M. And the straw bag I can’t seem to put down lately. What pieces have you resurrected from your past wardrobes? "Victoria Jackson | Part-time Magazine Editor and Lifestyle Blogger"
"How I Achieve My Rose Gold Hair"
I absolutely love your jacket, it's seriously to die for!